Anyone who has ever shopped for a high-quality saw guide knows that professional saw stops capable of withstanding the rigors of modern production are not easy to find. There are great differences between products and there is a maze of terminology. "Saw Stops," "Length Stops,", "Length Stop Systems", "Saw Guides," "Saw Fences," "Saw Accessories and Attachments," "Drill Press Accessories and Attachments," "Cutting Stops," "Positioning Stops," "Precision Stops," "Gang Stops," "Miter Stops," "Flip Stops," "Automated Stops," Automated Length Stops," Automated Saw Stops," and "Automated Positioning Stops" are just some of the names used. Needless to say, it can quickly become very confusing. But aside from names, the real differences between saw guides are in manufacturing quality, precision, versatility and cost. Saw stops for consumer-grade applications can generally be found in retail venues for cutting accessories, saw accessories and saw safety accessories, but they are unsuitable for production use. Some industrial catalogs offer specialized saw guides as part of positioning systems and linear measuring devices for industrial applications — but these tend to be very expensive and/or overly specialized. That's why Maya Posi-Stop™ saw guides were created. Designed to provide rapid setup, high precision, stability, long life, versatility and cost-effectiveness, they will serve well in even the most extreme production environments. The heavy cast aircraft-quality "356" aluminum alloy is heat treated to T6 conditions (some cheaper competing units are made with stamped or cast steel). The Posi-Stop frames are machined with precision CNC equipment providing excellent dimensional tolerances. Make no mistake — these units are designed to take abuse (yield strength equals 30 KSI!). Part of what makes a superior saw guide is a combination of simplicity and versatility. The Posi-Stop guide system provides exactly that: Two frames (3/4" thickness) are connected with 3/8"- 16 threaded steel rods and 1/2" OD aluminum spacers. The impact plates (Stop Plates) are machined from 3/8" x 2" solid 6061 T6 aluminum bar stock and then anodized for durability. The 6", 12", 18" impact plates are connected with same size support bars so there is never a need to alter the saw stop base. End support spring-loaded ball plungers or brass tipped set screws are in every bar. The impact plate squareness may be adjusted by correcting the distance between support bar and the impact plate. This provides a very simple, effective and stable linear positioning system that can withstand multiple impacts and still remain in calibration over time. 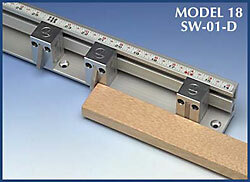 The saw stop's linear motion is guided by 5/16"-18 x 3/4" L. teflon tipped brass set screws. These are located vertically in the Posi-Stop C-Frames. The screws have a very low coefficient of friction, allowing them to glide effortlessly on the top edge of the Guide Rail, as well as providing simple square and height adjustments. A professional-quality production saw guide allows one-handed operation and the Posi-Stop system provides this capability. An adjustable metal handle with special 3/8"-16 hardened steel stud serves as locking mechanism. When the handle is in open position, the Posi-Stop can be instantly removed from the Guide Rail at any location. The components are all replaceable (3/4" dia steel swivel shoe). The 5/8" dia x 4" long tool steel round has a 3/8"-16 threaded hole. The handle locks with a simple one-half turn (C-clamp action). With a single lock average capacity of 420 lbs and a double lock average capacity of 800 lbs (static), there is plenty of strength for even very heavy materials. The Posi-Stop's visual readout is an easy-to-see 1/8" x 1/2" x 1 3/4" Lexan hair line indicator. The 1/2" dia x 4" long precision ground and hardened steel shaft insures long life. The 1/2" ID shaft collars are held by set screws. The stop indicator is attached to the bottom of the shaft collar, which can be moved 1" to the left or right, for fine positioning and calibration. In production environments, rapid setup times are essential and Maya Posi-Stop provides very fast alteration of position settings. The average repositioning time (unlock time + slide time + locate time + lock time) is only 3 to 5 seconds. Compare this with other commercially-available saw guides costing twice as much, with average repositioning times ranging up to 30 seconds, one minute or more! Add up all the time saved and you'll find that your Maya Posi-Stop system will pay for itself very quickly. The Posi-Stop System was originally designed, developed and introduced to the marketplace by the MAYA Co. in 1989. Since then, thousands of Posi-Stop units have been sold to a variety of concerns throughout the world. Posi-Stop linear positioning systems improve the competitive advantage of countless businesses across a wide range of industries by providing precise repeatable results time and time again. Thousands of Posi-Stop saw guides are in use today for cutting, drilling, lay-out and other industrial applications. 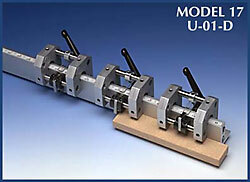 Part of what makes the Posi-Stop System unique is that it improves the accuracy and efficiency of metal, plastic and woodworking machines, jigs and fixtures at a modest investment cost. Comparable saw stops can cost several times the same price. When you consider it also minimizes production set-up time, run time and rework time, the added value is considerable. Improves accuracy and efficiency of metal, plastic and woodworking machines by reduction of the set-up time, run time and re-work time. Eighteen Semi-Custom made high quality models to choose from. Length stop system that combines smooth sliding with exact locating and positive locking. Used for metal work, manufacturing windows, doors, cabinets, furniture, millwork, construction and machine work, mass production — a virtually endless list of possible applications. 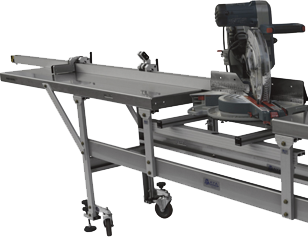 Easy to mount and calibrate on a variety of saw or drill press extension tables, conveyers, jigs, fixtures or lay-out tables. Maya offers three basic types: Rigid, Flip-Up and Gravity Action Posi-Stop assemblies. The type best suited for your application is primarily determined by the type of material(s) with which it will be used, the physical dimensions of the material(s) to be positioned, how frequently the positions will be altered, and the production method(s) to be applied. Components: 1/4" x 1" x 2-1/8" special shape impact plate machined from grade C-1018 ground flat stock. 1/2" dia x 4" L precision ground tool steel shaft. Two 1/2" ID clamp-on steel shaft collars. Set screws. The impact plate slides up when it is pushed by the work piece and slides down (gravity action) when the work piece is removed. Components: 1/4" x 1" x 1-5/8" special shape impact plate machined from grade C-1018 ground flat stock. 1 1/4"x1 1/4" x 2" stop block machined from solid 6061-T6 aluminum bar stock. 1/4-20 T-slot nuts, screws, and pins. The impact plate swings into the block when it is pushed by the work piece and swings out of the block (gravity action) when the work piece is removed. Maya can produce customized linear positioning systems on demand. We also offer a complete line of stainless steel tables, such as the roller table shown below. These units are designed for use with Posi-Stop System to create superior quality, unlimited length work stations for precision cutting, drilling and other industrial applications. Maya Posi-Stop™ is simply the best, easiest-to-use linear positioning device on the market. Unlimited applications include wood, metal and plastic for use with precision cutting tools, saws, drill presses, grinders, routers, and many others. Combining rigid impact plates (non-flipable) with positive locking and exact locating, they are easily mounted and calibrated on a wide variety of lay-out tables, saw and drill press extension tables and conveyors. For additional information about Maya saw guides, saw stop systems and production accessories, please see our engineering specifications or send us a message using the contact form below or call or write us at the address shown — we'll gladly answer any questions you may have. Click on image for enlarged picture.  Yield strength equals 30 KSI!  Frame thickness equals 3/4"
I am interested in knowing more about the Posi-Stop system. Please contact me.